2006. Digital collage (Adobe Photoshop). 8" x 10"
I haven't actually been to England (although my mom was born in Liverpool). 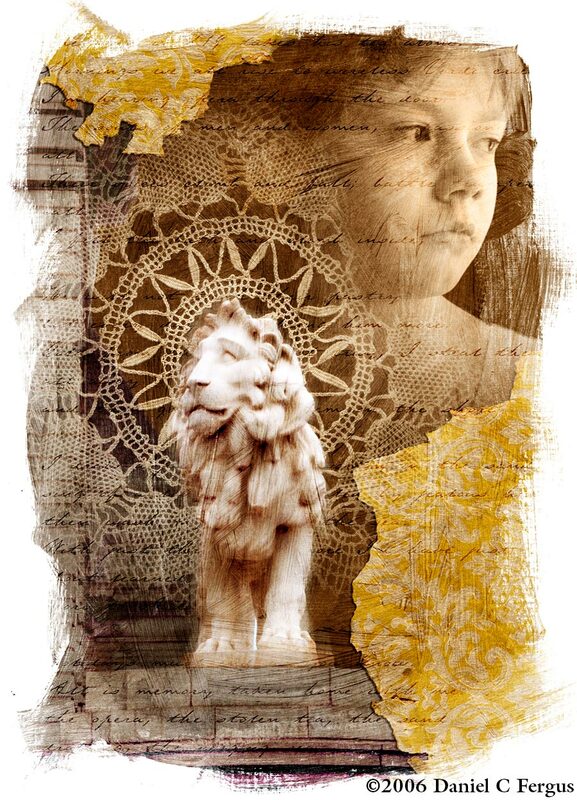 This piece began as a graduate school class project—we were asked to digitally "remix" an image, in this case a photo of a lion statue and some background structures taken in London by our professor Steven McCarthy. I incorporated some old wallpaper, handwriting, a doily, and a photo of my daughter (who coincidentally was the spitting image of my mom at that age) to create a somewhat wistful, nostalgic appearing piece. The title seemed appropriate. I should also note that my daughter and I love C. S. Lewis' Chronicles of Narnia, which was clearly on my mind as I was putting this together. Fans of the book (or movie) should have no problem drawing parallels.